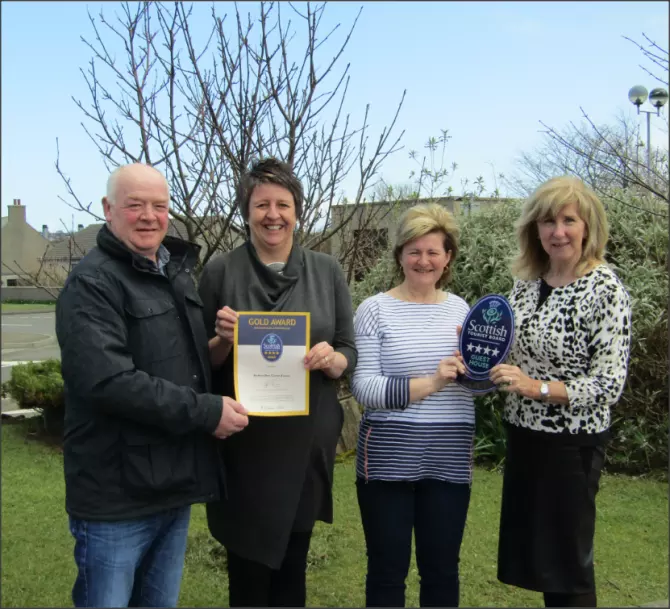 Scotland, 2017-Apr-20 — /Travel PR News/ — An Orkney guest house which overlooks the Bay of Eyrland and the hills of Hoy has achieved a coveted ‘Gold’ award from the national tourism organisation. Button-Ben Guest House had already achieved a 4-star grading, but has now been awarded the added ‘Gold’ status from VisitScotland, representing the continuing attainment of outstanding customer service and hospitality for its guests. The beautiful guest house is in a perfect location for exploring the Orkney Islands and is just a few minutes’ drive from the Mainland’s two main towns, Kirkwall and Stromness. The property has a total of four luxury bedrooms including one twin room and three double rooms, all of which have king size sleigh beds. Guests can relax in the cosy resident lounge whilst enjoying a warm drink and a home bake or some of Orkney’s famous fudge. Visitors can enjoy breakfast in the restaurant and try the tasty local produce on offer at Button-Ben as they have also been awarded Taste Our Best – a joint initiative between VisitScotland and the Scottish Government. Launched in 2013, the scheme is designed to recognise businesses including hotels, restaurants, cafes, takeaways, visitor attractions and B&Bs that not only offer a quality food and drink experience, but include and promote Scottish produce on their menus, to give consumers choice. Button-Ben has since joined the VisitScotland Information Partner (VIP) programme, through which the national tourism organisation works in partnership with businesses to recognise the work they are already doing in enhancing the visitor experience and bringing the Spirit of Scotland to life, including the provision of visitor information. May Harper, Owner of Button-Ben Guest House, said: “We were absolutely chuffed to bits when we were told we had achieved our 4-star Gold Award. “Before we started building Button-Ben we decided that we would like to aim for four stars, so we made contact with Barbara Foulkes, Island Manager and Lee Inkster, Industry Relationship Manager at VisitScotland as we knew what we wanted and where we were aiming to be, but we were not very sure what was expected of us and how to get there. “We gained a lot if invaluable advice on our annual inspections, as well as from Lee who has been a pleasure to work with and has always been there to help and encourage with ideas. Without all their feedback and input we would not have achieved this award. I would also like to thank Orkney Tourism Group, who have been an incredible help. Barbara Foulkes, VisitScotland’s Island Manager, said: “It is fantastic to see Orkney’s tourism offering enhanced by Button-Ben Guest House and their well-deserved achievement. This award is particularly impressive being achieved within just two years of the Guest House first opening. “We know visitors look for quality accommodation and value for money, which is why VisitScotland’s Quality Assurance schemes are so important to the tourism industry as a whole. “Button-Ben Guest House is an exceptional example of a business that is working in partnership with VisitScotland – making the most of our opportunities and drawing on our impartial advice and experience to invest in and develop their business. “Our Quality Assurance scheme helps businesses to reach their full potential and truly shine. The scheme is about more than just the ‘stars’ on the door – it’s about the entire visitor experience, about investing in your business and making it as sustainable as it can possibly be. Developed and improved for over 30 years, VisitScotland’s Quality Assurance (QA) schemes are world-leading and provide a trusted, independent and impartial source of information for visitors. They allow businesses not just to meet visitor expectations, but exceed them. QA can open the door to new customers. It is a powerful marketing tool and works well with online review sites in using an independent perspective to measure visitor experience against tried and tested criteria, so visitors know exactly what to expect. This entry was posted in Business, Hospitality, Luxury, Tourism, Travel, Travel Management, Travel Marketing, Travel Services, Travel Tips & Info, Travelers, Trips, Vacations, Villas and tagged Barbara Foulkes, Button-Ben Guest House, Gold Award, Lee Inkster, May Harper, National Tourism Organization, Orkney Guest House, VisitScotland. Bookmark the permalink.